Long ago, many children who lived in America’s cities had to struggle for a better life. This painting shows how difficult life could be for many people who arrived here from other countries and who settled in America’s cities. Here we have four real boys who lived in America over one hundred years ago. Were they friends? Probably. They are about the same age and are comfortable with one another. For example, one boy is leaning against another boy. What clues in the painting tell us they were poor? Their clothes are torn, they have worn-out shoes or bare feet, and they have weary eyes. Are there any other clues that tell us more about these boys? Do you see the brushes and half-opened tin of shoe polish in the bottom right hand corner? This is shoeshine gear. These boys may have shined shoes for a living. Why do you think they had to work? Maybe they were orphans and homeless or perhaps they came from large families and were poor. Can you imagine having to work for a living at such a young age? The title for this painting is Tough Story. Is one of the boys telling a story? The boy on the left who doesn’t have any shoes on is telling a story. 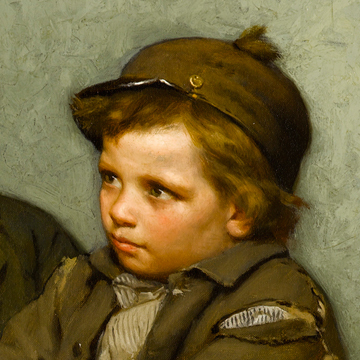 What clues in the painting make this boy look like he’s telling a story? Look at his head and his hands. His head is tilted to one side and his eyes are looking upward as if he is thinking hard to get all the facts straight. And his hands are pointing out in front of him as if he is making an important point. Look at the faces of the other boys. Do you think the boys are moved by the story their friend is telling them? Why is the story a “tough” story? Is it about some hardship? What about the boy on the right with the worn out boots and who has his hands clasped around his knee? What expression is on his face? Is he listening carefully? Is he perhaps troubled by his friend’s tale? 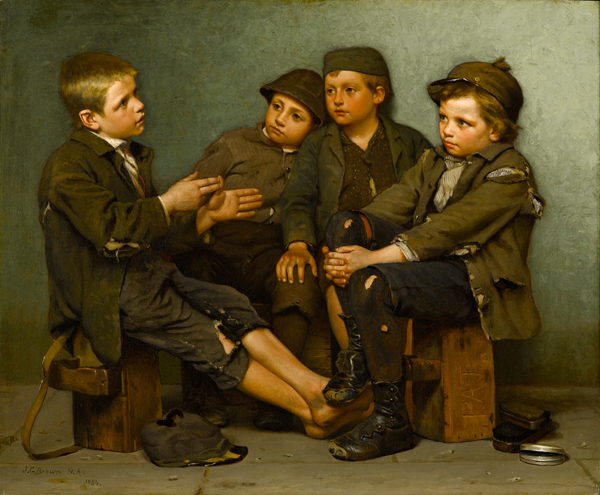 The artist who painted this picture paid real shoeshine boys to model for him. Look at the wooden crate box on which the boy on the right is sitting. It looks like something is carved into the wood. Can you tell what it is? Letters are carved into the wooden crate box. What do the letters spell? They spell out the boy’s name, Pat. His full name was Patrick (Paddy) Ryan. Paddy was a real shoeshine boy who lived in America over one hundred years ago. What character traits must you have to be a young person like Paddy Ryan and survive in the city? Must you be resourceful and courageous? Families who came to America long ago had to struggle because their survival was not guaranteed. Today, we have many charitable organizations and government programs that try to help struggling and poor families. Look closely. Do you think these boys are in a hurry to grow up? What about children today? What rights and responsibilities do children have when they become adults? The right to drive? The right to vote? The right to get married? The freedom to travel around the world? What do you look forward to doing when you become an adult? Would you like to see Tough Story in person? All you have to do is visit the North Carolina Museum of Art in Raleigh, North Carolina. Tough Story is in the American galleries at the museum. Or perhaps you would like a tour. Tours of the collection are given daily, except for Monday when the museum is closed to the public. If you prefer, you can contact the museum ahead of time and arrange for you and your friends to have a private tour. I’m sure a docent at the museum would be happy to show you and your friends Tough Story and many other works of art. Whether you visit the museum on your own or have a tour with a docent, it will be well worth your time!